Let’s do this! We’re going to need a loaf of Italian bread, an onion, fennel, sausage, and cheese. I used a very tasty pork sausage with apples, walnuts, and rosemary. A nice fennel sausage would have been just as good. Gruyère was my choice of cheese, but any flavorful melter will do. Cut the bread into cubes and pop them in the oven to toast while you brown sausage and sauté onions and fennel. 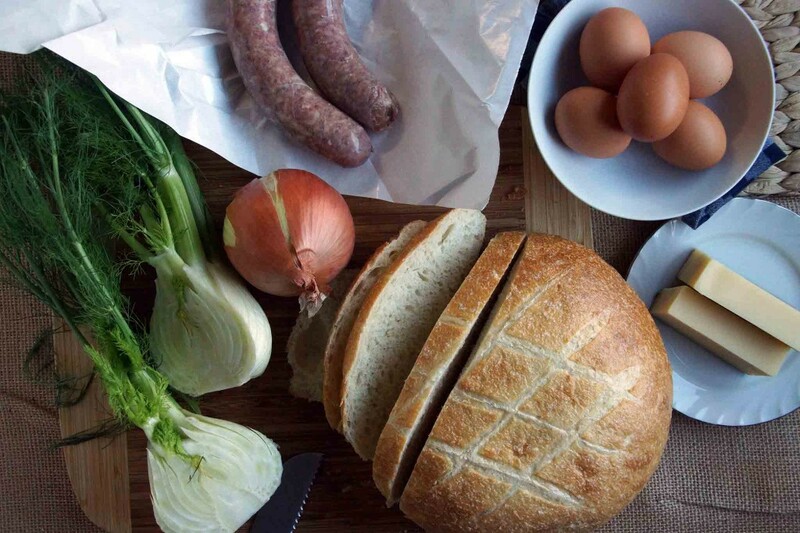 Toss the toasted bread with the sausage and sautéed vegetables in a large bowl. Whisk together eggs, milk, and cream to make an eggy custard in another bowl. 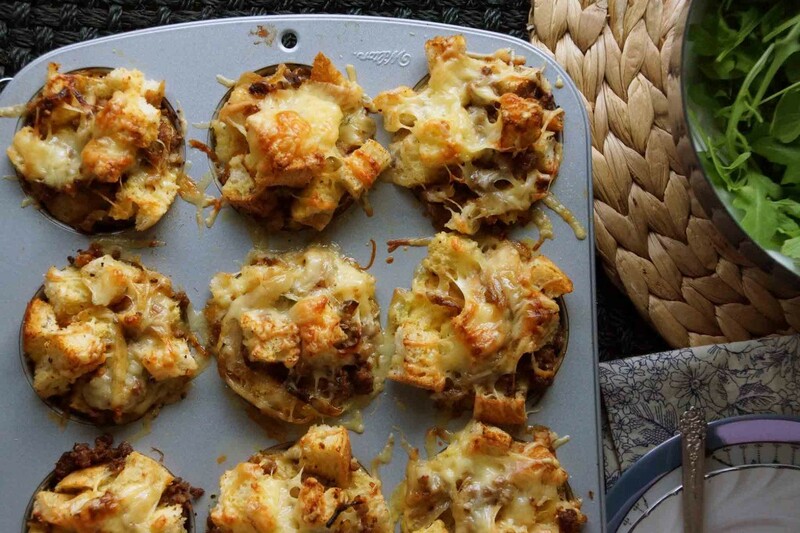 Grate the cheese and butter a muffin tin. 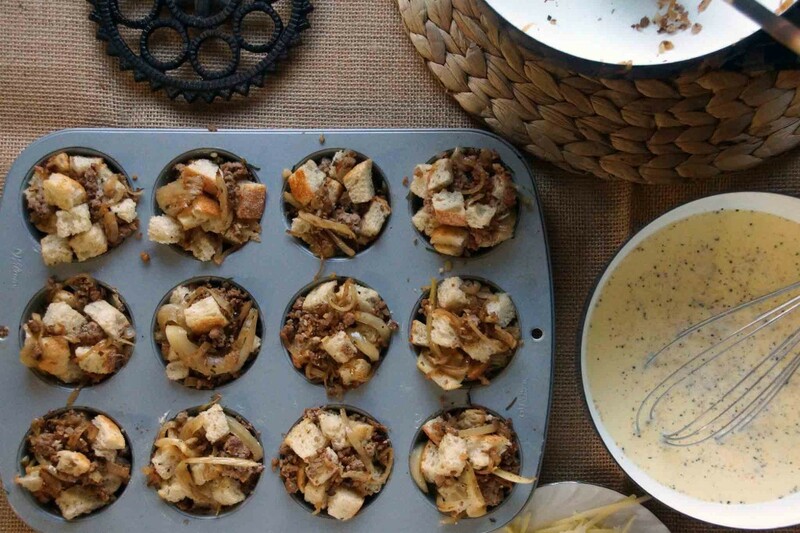 Pack the bread mixture into the muffin cups and pour the custard into each cup. I do it like this rather than mixing the 2 in a bowl before packing the cups so there’s more variety in texture. The tops will absorb less custard and be crispy and crouton-y, the bottoms will be tender and eggy. 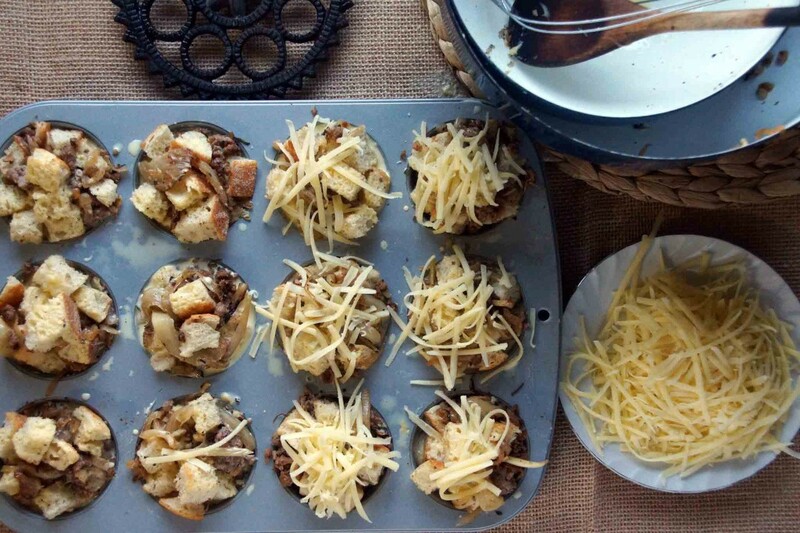 Sprinkle each muffin with the grated cheese, cover with plastic, and refrigerate overnight. All that’s left to do is bake and eat. Get a good night’s sleep, roll out of bed, and pop your mini stratas in the oven. 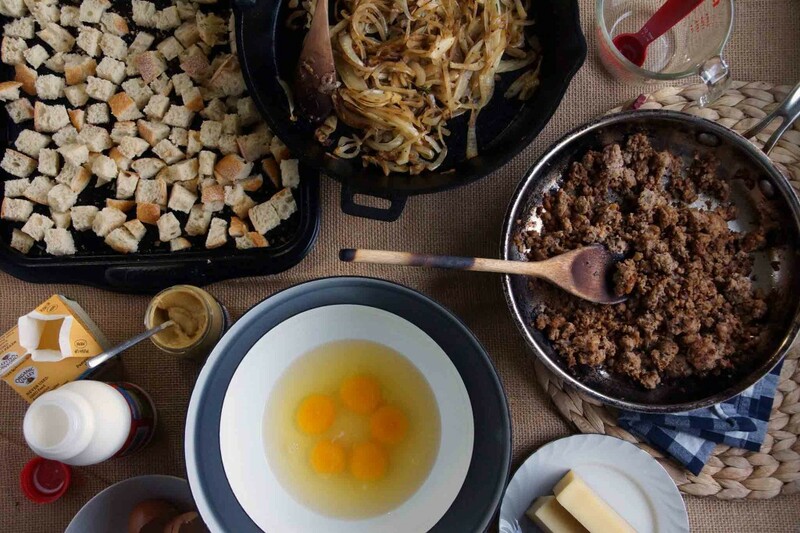 Stay in your jammies, sip your coffee, and read the newspaper: this is brunch done right and the flavors of Thanksgiving whenever you want them. 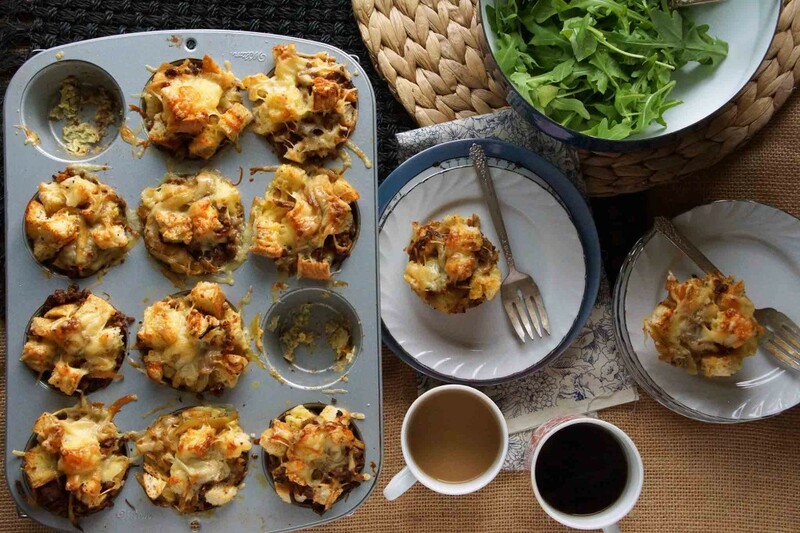 Overnight egg strata allows you to brunch AND sleep in! Preheat oven to 350°. Spread the cubed bread on a baking sheet and toast for 10 minutes, stirring the bread around halfway through. Meanwhile, heat 1 Tbsp. butter in a large sauté pan over medium heat. Add the sliced onion and fennel with a pinch of salt and sauté until wilted and golden, about 15 minutes. Stir in the rosemary and a few twists of black pepper. In a separate sauté pan, brown the sausage over medium heat, 8-10 minutes, breaking the sausage into small pieces. If there is a lot of fat in the pan, drain the sausage on paper towels before proceeding. 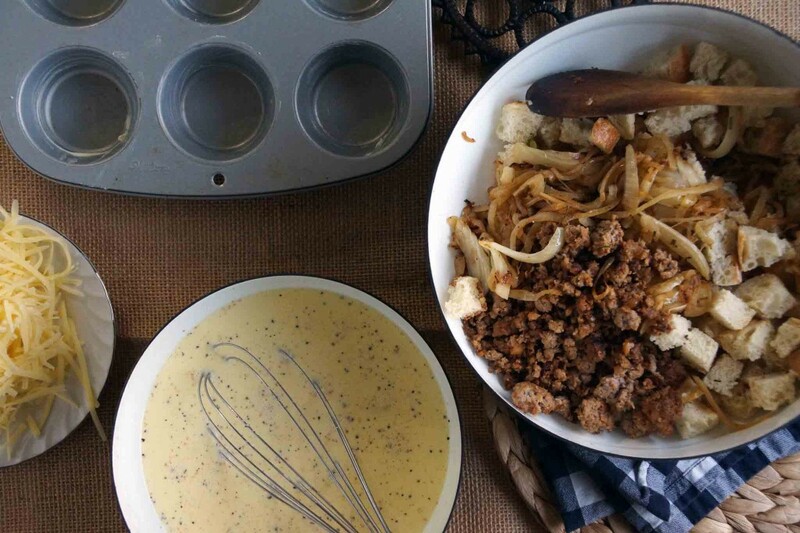 In a large bowl, combine the toasted bread, sautéed onions and fennel, and the browned sausage. 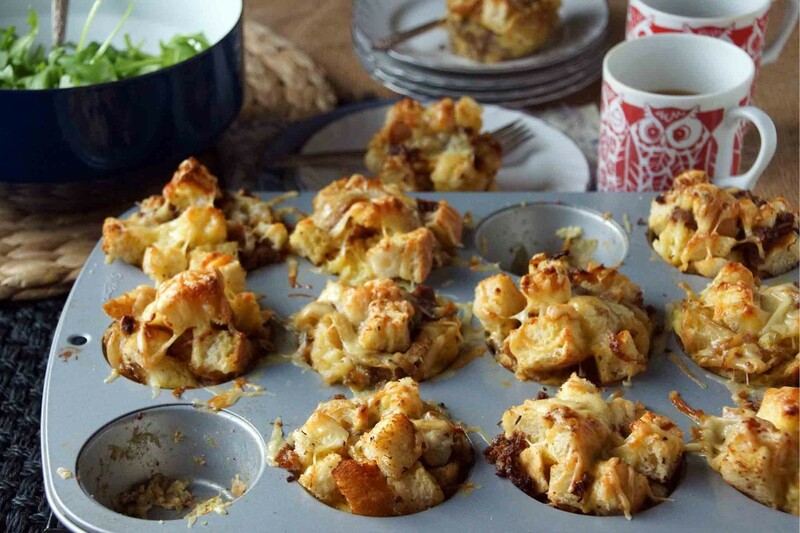 Generously butter a muffin tin and pack each cup with the bread mixture. In a medium bowl, whisk together the eggs, cream, milk, mustard, nutmeg, ½ tsp. kosher salt, and ¼ tsp. black pepper. Slowly pour the egg mixture into the muffin cups. Top with the grated cheese, cover, and refrigerate overnight. The next morning, preheat oven to 350°. Bake the stratas until the egg has set, the cheese has melted, and the tops are golden and crispy around the edges, about 30 minutes. Allow to cool for 5 minutes (it makes it easier to get each strata out in 1 piece!) and serve. I think I will make these for Thanksgiving brunch and think of you! These are gorgeous! I love that they require so little attention first thing in the morning as all the work is done the night before. Pinning to try soon! Can hardly wait to make these! Thanks for posting. This is such a neat idea. Now I’m pondering all the variations of strata I can make with my muffin tin. I added your post to my weekly link love column on my blog at http://www.rawinthemiddle.com/link-love-2/. Have a lovely day! The possibilities are endless! 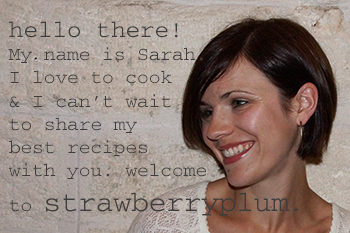 Thanks for featuring me on your site! These look amazing! Do you think I could do it in one large baking dish instead of the muffin tin? Absolutely! You’ll need to increase the baking time and if the top begins to brown too much before the center sets, cover it loosely with foil. Good luck! Is there any way you have the nutrition facts?